Nice article. Your blog is incredible. I was just wondering, I mean I assumed that John’s PTSD was as wrongly diagnosed that as the reasons for his intermittent tremor and psychosomatic limp… in other words, that he didn’t have it at all, and everything amounted to missing the action and not knowing how to make the same difference with such a skill set as a civilian. (Unless this reaction can also be considered PTSD? I admit to not knowing especially much about it.) So, the fifteen minutes of PTSD, instead of being that, were fifteen minutes of a misdirected diagnosis, when the actual problem was his missing the battlefield. And if that IS Watson’s symptom of PTSD, then his therapist certainly didn’t realize it, which makes it kind of moot. That’s how I read it, at least! Very interesting comment, and I would agree with it except (there is always an except) that, if you remember, Holmes concurs with the therapist. “I’m afraid she’s right.” And we KNOW that Holmes is never wrong. I completely agree that the adrenalin rush he gets being involved with Holmes’s mysteries are a replacement for the battlefield and brings Watson out of the doldrums. His new interests give him something to occupy his mind other than brooding on what he experienced in Afghanistan. Thanks for the reply. I’m sure you’re right – the only scene that comes to mind me for me is when he’s discussing the psychosomatic limp specifically, and I took that to mean just that Sherlock was acknowledging that John’s troubles are brought on (at least in part) by the war, but I didn’t make a direct connection to the PTSD diagnosis. However, I’ll be rewatching the episode, and in any case, I have a feeling your interpretation is closer to the mark. I guess maybe I’m adverse to it because then I’d feel the depiction of PTSD is trivializing something that’s very real and very painful for many people. Then again, television is not known for its sensitivity. You may be right.It is sometimes hard to know what writers are getting at. I know that I didn’t like the added aspect because it was inconsistant with the character. I agree with K.Wagner…when Sherlock says “quite correctly, I’m afraid” he is referring to the limp being psychosomatic, not to PTSD. Mycroft (who is smarter than Sherlock either way) points out that he actually doesn’t have PTSD at all but is instead missing the battlefield. Therefore his sudden recovery makes totally sense – as soon as he is useful again, and gets his share of adventure, he just forgets about his cane. 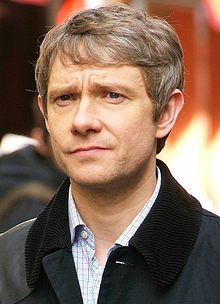 Personally, I consider Martin Freeman as the best Watson ever for the simple reason that this adaptation is the first one who really asks (and answers) the question why Watson should put up with Holmes strange habits. I also love that they added the sarcasm which Watson sometimes displays in canon. Plus, Freeman is so incredible good in playing the everyday man. I just needed to hear his sight after the nightmare and I was already routing for him. It’s also nice that the show takes its time to introduce Watson instead of skipping immediately to Sherlock Holmes. Mycroft also said that when you walk with Sherlock Holmes, you see the battlefield. So going along with Sherlock is helping him cope with being away from the action in Afghanistan. Sherlock said the limp was psychosomatic, not that it was necessarily caused by PTSD. Even if he did believe that, this version of him can be wrong sometimes like he was about the gender of John’s sibling. I don’t think PTSD was his diagnosis though since a big part of his reason for the cab chase scene was to get John to realize that once the adrenaline took over and he didn’t feel useless/bored with civilian life the limp would disappear. I don’t know either if this would still be considered PTSD or if it even makes sense medically, but I think the writers wanted us to get the sense that John’s depression at the beginning was because he missed the action and could no longer be content with the tediousness of civilian life (hence his nothing happens to me comment). You make a compelling argument. As I said, Watson is an adrenaline junkie. He was in the canon stories as well. Interesting discussion. I understood the whole PTSD/pyschosomatic leg/John’s depression the same way you did, Casey. I’d only add that the therapist never really says particularly that the limp was psychosomatic. Sherlock clearly realised it was, told John and proved that he could overcome it via the cab chase (i.e adrenaline rush by working with Sherlock). The conversation with Mycroft was the mention of PTSD because he (likely thorough his connections) had glanced at her notes–he did mention the “trust issues” noted by the therapist. So, he likely knew that she had diagnosed him with PTSD and promptly disagreed after meeting John. My view is that the only reason to mention it was to disprove it and to show that Mycroft had outsmarted conventional therapy. He also sees the adrenaline junkie that John is (as does Sherlock through the cab chase). Valerie also makes an interesting comment and I can’t say that it doesn’t seem quite valid. I guess my question at this point is why have that scenario at all? Watson had a real wound (or two). I suspect the writers wanted to make the story more “relevant” to the current times. I guess I let my own outlook color my attitude toward the story, also. The PTSD problem it seems is an assumption these days about soldiers because of the media. Fortunately it is still the exception not the rule. It seems that people confuse natural emotion over a significant event for some type of psychological problem. The two are quite different. I think they added it for two reasons. One was naturally the nod to canon. The other one falls along the same line of why Anderson and Donovan call Sherlock a psychopath, and he himself a sociopath. He naturally is neither, but in out modern times, we have developed a tendency to analyse everyone who is somehow different as abnormal, and the series comments on this (quite cleverly imho). A child which has trouble to stay still? This has to be an disorder! A soldier has trouble to adjust to civilian live? PTSD! Not saying that those disorders not exist, but sometimes people are just different and don’t need to be “cured” of anything. In John’s case, he doesn’t need a cure, he just needs to feel useful. And in Sherlock’s case, he doesn’t have to be diagnosed as anything, he is just different.